Le Maitre’s range of VS – “virtually smokeless” pyrotechnics is continuing to expand and receive excellent feedback from the market, followed up with increasing orders! At Prolight & Sound Frankfurt, Le Maitre will be launching several new stunning effects to the range: VS Mines (15/25/35ft), VS Starbursts (Small/Medium/Large), VS Ice Waterfalls (8/15/20ft), VS Volcano Mines (Small/Large), VS Ice Gerbs (10/15/20ft) and VS Flashes. In addition to much reduced smoke levels the VS range has incredible intensity and depth of colour compared to conventional pyrotechnics which although bright, tend to be less vivid. Le Maitre’s VS products all have much deeper and more vibrant colours, particularly noticeable with the blue, purple and pink colours. The VS range was originally conceived back in 2010 when Le Maitre’s R&D team, based in Peterborough, UK were looking into improving the visual impact of effects by overcoming typical but unwelcome by-products of pyrotechnics. Conventional pyro can produce a lot of smoke and ash and with the advent of HD television and the increased use of pyro in sporting events these by-products needed to be addressed. Le Maitre’s R&D team set to work, fundamentally changing chemical compositions. They moved away from metals and products that produce the solid particles which make the unwanted smoke and have replaced them with products that burn more cleanly and don’t produce solid particles. The first products the team worked on were Flares as their magnesium base made these extremely smoky items. The resulting VS Flares were a resounding success, not only resulting in virtually no smoke, but also producing an extremely strong colour and aura. Buoyed by their success the team moved on to successfully develop the VS Flame range and VS Small Starburst range, with all three being launched in 2011. More recently the VS range has been further added to with VS Falling Stars, VS Coloured 8ft Ice Gerbs and VS Intense Flames. The VS range is also benefitting from the Company’s newly automated production process installed at the Peterborough manufacturing plant last year. Primarily invested in to address growing demand it also enables the faster prototyping of new compositions, drastically reducing the time to market for products under development as well as improving product consistency. “The VS range is in line with Le Maitre’s strategy of continuously introducing the best range of visually stunning pyrotechnics on the market ensuring spectators get to see the effects at their very best!” states Karen Haddon, Joint Managing Director and Owner of Le Maitre Ltd. Le Maitre is delighted to be adding the ScentFX range of unique scenting products to its range. The scents are ideal for adding that extra sensory dimension to occasions such as weddings, theatre shows, concerts and commercial launches to name just a few. ScentFX can enhance events with the aromas of fresh roses, vanilla or chocolate through to the more exotic crushed lime and mint or cotton candy scents. Le Maitre will be offering 14 olfactory delights in total! Safe, environmentally friendly and simple to use, ScentFX natural ceramic beads are infused with high quality authentic scents which are supplied in easy to handle sleeves. Using the Velcro pads supplied, ScentFX sleeves are quickly and easily adhered across fans, blowers, smoke or haze machines. Scent sleeves provide a scent effect for 10-12 hours and can cover areas of 2000 to 5000 square feet – indoors or outdoors! Safety and the environment are of the utmost importance to manufacturer Scentevents and the dry system involves no liquid, no mess, no lingering odour and no oily residue. All ingredients meet international safety guidelines. Le Maitre has added a brand new product to its special effects line-up with a powerful confetti cannon. The ProConfetti Blower projects confetti and glitter some 40-60ft to create an arena-full of swirling confetti. The continuous, hand-fed blowers use easily connected liquid or vapour C02 bottles to propel the confetti across theatre or concert stages, sports stadiums, or audiences, indoors or outdoors, covering huge areas in just a matter of seconds, processing confetti at speeds of 3-10kg/minute (dependent upon operator). There are three possible blower angles for the operator to choose from depending upon the projection angle required. The ProConfetti Blower is a robust 50kg unit requiring no electricity. Liquid C02 consumption is at 0.2-0.4 kilo/sec. Le Maitre hazers are known for their incredible output and low power consumption, not to mention the haze fluid which produces the purest, most efficient and long lasting haze on the market. To make this benefit even clearer to customers, Le Maitre has now re-branded its haze fluid as “PureHaze Fluid”. Le Maitre’s PureHaze Fluid is 85-90% active ingredient combined with just 10-15% water. Not 80-90% water and only 10-20% active ingredient as is the case with so many other haze fluids on the market. In fact many aren’t even true hazers at all but simply smoke machines with fans and which consequently have to use much lower concentrated solutions which are in fact smoke fluids. As a result, competitive haze systems need to create 8 to 9 times the output to achieve the same haze effect that Le Maitre’s Haze machines produce. Put quite simply a competitive unit would need to consume 8 to 9 times more fluid just to produce the same haze effect! Combine this with the fact that Le Maitre’s sugar-based fluid is extremely green and completely safe to use on the stage or in crowded clubs and Le Maitre’s PureHaze fluid is an environmentally friendly winning product all round. Le Maitre’s haze fluid is included in equipment guidelines, calibration and health effects reports on the use of smoke and haze prepared by bodies including ESTA (now PLASA) and Environ. Le Maitre will be demonstrating their full line-up of smoke, haze and low fog machines along with a selection of pyro controllers and accessories as well as videos of their pyrotechnics. Salamander Quad Pro – The Salamander Quad Pro is a four canister system that can be operated with each canister being fired independently and the option of multiple colours being loaded to provide a truly stunning visual display from a single machine. Up to 120 hits in total can be achieved with each flame reaching around 4m in height. Alternatively all four canisters can be fired at the same time to produce a much bigger single flame reaching up to a spectacular 7 to 8 metres – terrific for stadiums! Salamander – The Salamander, Le Maitre’s single-canister 4m high flame unit will also be on show with Le Maitre firing four Salamander flames from the top of their stand truss, providing a truly spectacular live demonstration with lighting fast chases of red and natural 4m. HazeMaster – Le Maitre’s most advanced and powerful hazer yet. With its massive output capacity, high power variable fan and low power consumption it really is a class act. The combination of an industrial grade air-pump, a 2-stage heating process and a microprocessor controller, produce an output so powerful that the HazeMaster can convert up to 750cc of fluid per hour! Add to that the rugged construction and you have a true professional hazer engineered to withstand the rigours of the road when on tour. MVS Hazer – a powerful and versatile hazer with two variable-speed, high power fans used to control the force and direction of the haze stream. There is also a unique oscillating mode for automated back and forth sweeping of the stream. 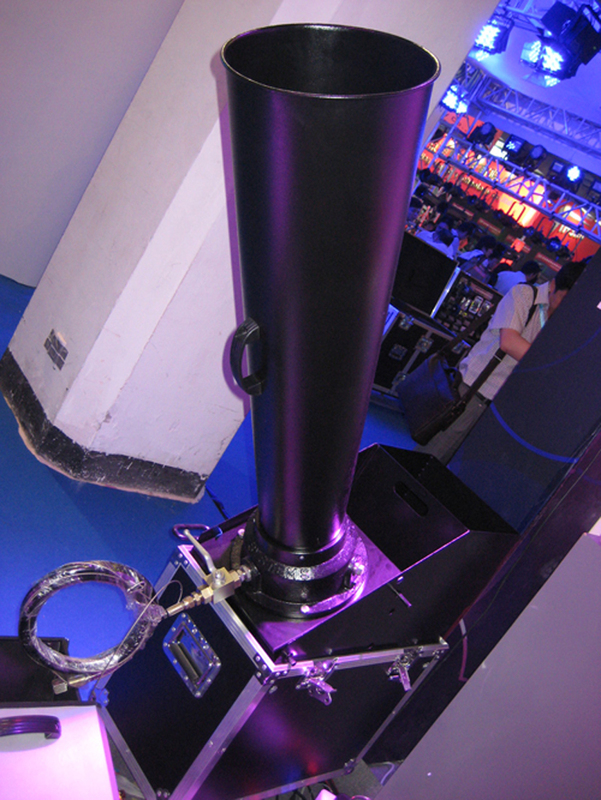 The MVS is geared towards medium to large sized venues. Neutron Hazer – the popular, entry level hazer, ideal for small to medium sized venues. Its success lies in its simplicity and straightforward and economical operation – just switch on and it quietly produces haze for almost 100 hours on just 2.5L of fluid! G300 Smoke Machine – Le Maitre’s flagship water-based smoke machine is rugged, versatile and has a very high output. The G300 is a uniquely dual-mode machine, offering both smoke and haze. Designed to perform in the most demanding of applications, it is the machine of choice among touring, rental, theme-park and cruise ship customers. GForce 1/2/3 Series Smoke Machines – Le Maitre’s range of high powered, continuous flow, water-based smoke machines, based on the core technologies of the G300, but engineered with new design and manufacturing enhancements, making them extremely economical. Freezefog Pro Low Smoke Machine –The system of choice on stages, in studios, clubs and parks, this liquid CO2 chiller produces a dramatic, low-lying smoke effect when used in conjunction with a G300 or GForce smoke machine. Mini Mist – A robust, hand-held aerosol smoke machine which uses a smoke fluid canister to create a thick fog effect. Ideal for TV and film, as well as the emergency services for breathing apparatus training exercises.